The Razor E200 Electric Scooters are perfect rides for pre-teens aged 12 and older. Once this scooter has the initial battery charge under its belt, your kids will be zooming around the neighborhood having the best outdoor fun that they’ve ever had with a scooter that can be ridden right out of the box! The E200 travels at a maximum speed of 12 mph with its 24 volt (two 12-volt) battery power. This is a very safe and very fun way for your kids to get around. The E200 has slightly more speed than its younger sibling the E100. It also has a weight limit of 220 pounds where the E100 is rated for only 120 pounds. Although this scooter travels at a speedy pace, it’s so well built that it’s not noisy and annoying. They have an incredibly high performance and high torque chain driven motor that is so quiet that it won’t annoy any of your neighbors. Your kids can buzz throughout the neighborhood and you can have peace of mind. Like the E100, this ride requires a manual kickoff of 3 mph before starting. Once they reach this speed, your child can just press the trigger and the motor will engage. The twist grip accelerator control is easy to operate and the hand operated rear brake makes stopping very easy. Both front and rear tires are pneumatic and 8” in size and contribute to the smooth ride. The full size deck and frame makes this a very safe and steady ride for extra safety. As an added feature, they’re very transportable and have a folding handlebar mechanism that makes carrying them in the car a pleasure. As with any motorized ride, it’s important for parents to make their children aware of all safety measures that will ensure they have the safest ride possible. There are a few scooter safety tips that are essential to a safe ride, including safety helmets, proper shoes, and form fitting (not loose) clothing. The Razor E200 Electric Scooters are the perfect ride for those kids who don’t need a beginner ride and those who are too young for the 300 and 500 series rides. Remember, this is not a toddler scooter. Pricing is very reasonable for all of the features that it has to offer and to top it off you can normally get some free shipping to go along with it. And most importantly, don’t forget to use proper scooter safety measures so your kids will enjoy their ride for years to come. The Razor Siege Caster Scooter is the most revolutionary scooter that you’ll ever find. It’s part scooter and part caster board and is more fun than you can imagine. Kids love this ride because even though it’s not electronic, their feet never have to touch the ground to propel the scooter. This is because Razor’s cool caster wheel technology and twisting deck allow kids to just twist and transfer their weight to get this scooter moving. The Siege has a flexing deck that has a support torsion bar and handlebars that fuse together. Your kids can either kick and ride like a normal scooter or they can self-propel with some awesome side to side movement that will give them a ride they’ll never forget. This scooter is like a hybrid that lets kids master sideways drifting, twisting, and propelling like never seen before. Some kids even compete professionally with these incredible rippin’ rides that have taken street technology and perfected it. The twisting deck is steel reinforced will carry up to 143 pounds. The front wheel is 125mm and the rear wheel is a 360 degree caster wheel that allows for all the side movement. The handlebars are adjustable and they fold for easy storage. Your kids can get on the road immediately with their new ride because there’s no assembly required. The Razor Siege Caster Scooter is age appropriate for children who are 8 years or older. Just use your judgment as to whether the younger kids will be able to handle this ride. You can be sure they’ll want to try when they see big brother tearing down the street! Not only is this scooter fun but it’s also got some developmental benefits. With all that twisting and turning that’s going on, your kids will be developing better balance and coordination. They’ll be gaining some independence as they tool around the neighborhood and they’ll be learning interpersonal skills. You can be sure that this scooter will be an attention getter and your kids will be conversing and playing with more kids than ever. 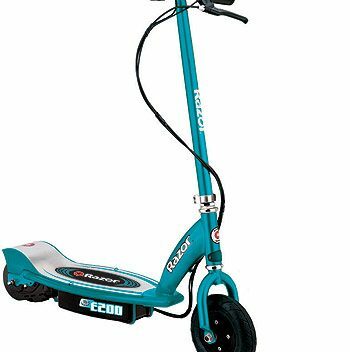 I’m kind of envious that there weren’t any Razor Siege Caster Scooters when I was young. I don’t know if I could ride one now but I sure would like to try. Let us know if you have one in your home or in your neighborhood. What do you think of them?